The cable is made of Nylon Braided material which is far more sturdier than other ordinary cords. Nylon cable with high strength and high environmental protection, make it wear- resistance, safe and reliable. 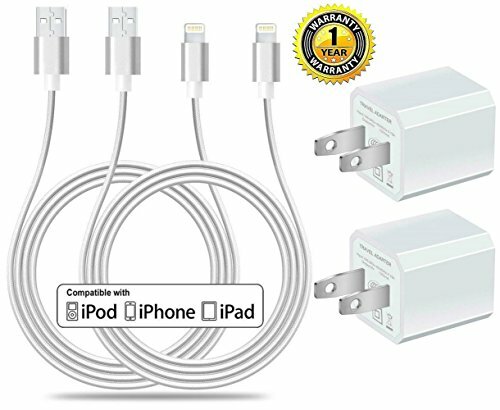 Lightning to USB cable for iPhone, iPod, and iPad is ideal for connecting your newer generation Apple mobile devices to PC or Mac computer for charging and syncing, or to the Apple USB power adapter for convenient charging from a wall outlet. This Wall Charger is NOT compatible with tablet! Why do adapters get hot? Well, they have to convert the Alternating Current (vibrating electrons) from your wall socket into the Direct Current (moving electrons) that electronic components need to function. Basically, it converts one form of energy into another, just as a car engine converts fossil fuel into mechanical push, and just like a car engine, the process isn't 100% efficient and some (or a lot) of the source energy is lost as heat during the process. 12- Month Replacement Warranty and 30-Day Money Guarantee. Contact US Directly and we will provide you with the most perfect service!